At BGH Dental, we are fortunate to offer Six Month Smiles as an option for cosmetic orthodontics. If you are bothered by misaligned teeth but don't want to spend years wearing bulky metal braces, these might be the perfect solutions. Would you like to achieve your optimal orthodontics results in the shortest amount of time possible? Then, Six Month Smiles is for you! You may qualify to receive treatment with the Six Month Smiles system of clear brackets and white wires. This braces system can shift teeth into their proper place in as little as half a year! And it is virtually invisible! Speak to Dr. Jenna Bagley Hrinda to discover if this treatment is the answer for your smile. If you’re like the millions of US adults who want to straighten their smiles without spending a year or more with a mouth full of metal brackets and wires, call BGH Dental to schedule an orthodontic consultation. Dr. Jenna Bagley Hrinda is a certified provider of Six Month Smiles. 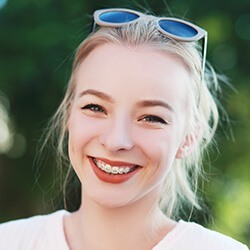 This cosmetic orthodontic treatment is ideal for adults who want to improve the appearance of their smiles, but who do not necessarily have complex bite alignment concerns. Six Month Smiles is a bracket and wire orthodontic system like traditional braces, but the materials are clear or tooth colored rather than being crafted from metal. Why is Six Month Smiles so Fast? Unlike other forms of orthodontic treatment including traditional bracket and wire braces, the Six Month Smiles system only shifts those teeth that are visible when patients smile, sometimes referred to as the “social six.” Because the entire bite isn’t being shifted, the process is completed much more quickly. Depending on your specific needs, the entire Six Month Smiles treatment takes between three and nine months. Because Six Month Smiles only shift those teeth in the front of the mouth, they are not ideal for patients who need to realign their entire bite or for young adults whose teeth may still be shifting. However, for adults who would like to quickly and comfortably improve the alignment of their smiles, Six Month Smiles may offer the ideal orthodontic solution. If you’ve been considering a straighter smile, we can use Invisalign clear braces to align your teeth without the hassle and appearance of traditional orthodontics. We offer various orthodontic options, but Invisalign is one of the most popular. These clear plastic aligners are easy to use and wear, plus, they’re incredibly hard to notice while you’re using them. Read to learn more about Invisalign, the process, and whether or not you may be a candidate.